07.27.17 Complete Update: I originally posted this back in October of 2014, and have since gotten a better hold on working beanies, and have come with a better set pattern for each size. There are a lot of other great patterns out there, but this is my own, created over many hours and seatings, worked and settled with my own tension and gauge. Everyone crochets a little bit differently, but the great thing about acrylic yarn, and these beanies though is that the sizes will stretch to fit a range of sizes. Another great thing I’ve discovered is that with the I9/5.5mm hook, each round worked increases by 1″ in size, so it’s easy to determine ahead of time if the crown size works out – Check after Round 3 to see if you are on the right path. Keep in mind that different yarns will work up a little bit differently in the sizing. This particular pattern was written using all Hobby Lobby’s I Love This Yarns because this is one of the yarns that I use the most. Working with other worsted weight yarns could produce a slightly smaller or larger product so make sure to check your gauge! And if you need to make an adjustment to better meet the crown size, I would recommend starting by simply adding or subtracting one stitch from the first round. – 75-195 Yards of Worsted Weight Yarn – I used Hobby Lobby’s I Love This Yarn in Brown, Yellow, Sungold, Forest Green, Cream, Purple, and Cranberry. One 7 oz (355 yards) skein will make multiple hats – with one skein, I was able to work up a Toddler, Child, Adult Small and Large size with one pom pom on the top, and still had a small amount left. Times range from 30 minutes to two hours. The Newborn Size has a crown of 4.25″ in diameter, a circumference of nearly 13.5″ to fit a head size of 13″ 14″, and is 5″ in length. The 3-6 Month Size has a crown of 4.75″ in diameter, a circumference of nearly 15″ to fit a head size of 15″ 16″, and is 5.25″ in length. The 6-12 Month Size has a crown of 5.5″ in diameter, a circumference of nearly 17.5″ to fit a head size of 17″ 19″, and is 5.75″ in length. The Child Size – Teen/Adult Small Size has a crown of 6.25″ in diameter, a circumference of nearly 19.75″ to fit a head size of 20-22″, and is 7″ – 8.5″ in length. The Adult Large Size has a crown of 6.75″ in diameter, a circumference of nearly 21.25″ to fit a head size of 22-23″, and is about 8.5″ – 9.5″ in length. 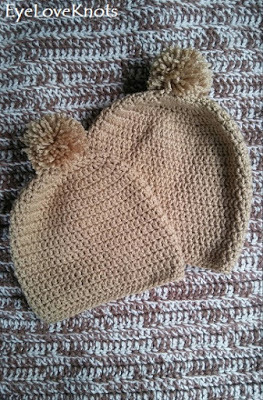 If you need some help working one of these beanies, I have a step by step photo tutorial in my Women’s Basic Beanie post, and I even explain how to make a fun pom pom to embellish the top of the beanie with! R8 – 10: Repeat Rounds 6 and 7, ending with a Round 6. R8 – 10: Repeat Rounds 6 and 7. R9 – 11: Repeat Rounds 7 and 8, ending with a Round 7. R9 – 12: Repeat Rounds 7 and 8. R10 – 13: Repeat Rounds 8 and 9. R10 – 16: Repeat Rounds 8 and 9, ending with a Round 8. R10 – 18: Repeat Rounds 8 and 9, ending with a Round 8. Please feel free to make and sell your own Basic Beanies using this pattern, but please DO NOT claim this pattern as your own nor should you sell my pattern, and DO NOT re-publish my photos as your own. DO NOT copy and paste my pattern anywhere, link to it instead. Now that I have a basic pattern for each size and one of each on hand, it will make working other versions of the basic beanie much easier – such as determining where to add the stripe/s to a striped beanie. I have a couple ideas in mind, but feel free to send in your requests! Would you like to add a fun Pom Pom to the top of your beanie? 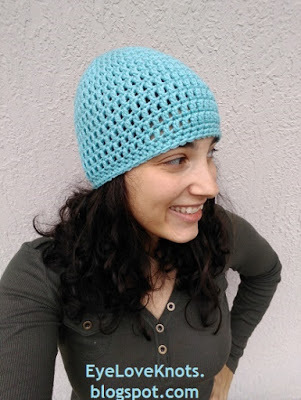 Visit my Women’s Basic Beanie Pattern to see how! 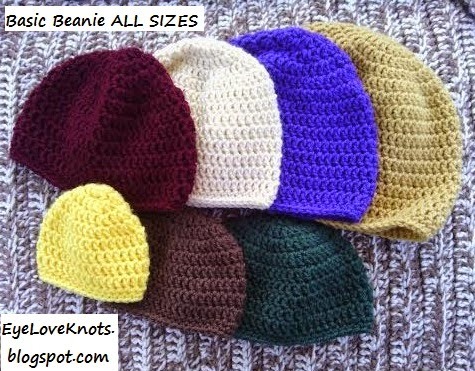 or EyeLoveKnots Craftsy – Basic Beanie, All Sizes. With so many size, yarn type and color options, I would love to see them! Join the EyeLoveKnots Crafting Community to share your creations, and see what other’s are up to! Share your version of this project on Ravelry – Basic Beanie, All Sizes. Check out the EyeLoveKnots Ravelry page to keep track of all your EyeLoveKnots favorites in your que, and share your WIPS and finished projects! Don’t Crochet but Interested in Purchasing a Crocheted Beanie? Quick DIY – Jack O’Lantern Stud Earrings – Buttons to Jewelry! Thanks so much for letting me know! Just fixed. Sorry to have confused you.